CHITTENDEN—The Vermont Huts Association will build yet another new hut come Spring 2018. Chittenden Brook Campground, near Brandon Gap, on Sept. 28. On Thursday, Oct. 5, Executive Director RJ Thompson announced at the organization’s birthday bash at Outdoor Gear Exchange in Burlington that it plans to rebuild the South Pond cabin in Chittenden. The structure burned down on Jan. 16, 2018, in a blaze that the state police suspect was arson. The cabin sat on 2,700 acres of land purchased by the Trust for Public Land for $4 million in December 2017. The structure itself was appraised at $300,000 and its loss presented what Thompson called a significant blow to the organization financially in its early days. As Thompson pointed out to attendees on Thursday evening, the South Pond cabin was in an ideal location because it opened up access to multiple recreation opportunities and a variety of user groups, from hikers to backcountry skiers and mountain bikers. Located in the town of Chittenden, it sat just a quarter of a mile off of the Long Trail (a spur was planned between the Long Trail and the hut) and it was close enough to the existing Catamount Trail that a reroute had been proposed to allow users to move from the long-distance ski trail to the South Pond cabin. Additionally, the cabin sits along the planned route of the future Velomont Trail, a proposed end-to-end mountain biking trail from Killington to Stowe that would use the same corridor as many of the Vermont Huts Association’s proposed huts. Thompson said Thursday that Vermont Huts and the Trust for Public Land have been in communication with the Green Mountain National Forest about having the 2,700-acre parcel at South Pond re-designated as national forest land over the next two years. However; once built, the shelter will be owned and operated by the Vermont Huts Association. According to Thompson, the facility will be operational year-round and will sleep 14 guests and one caretaker. Guests will have the option of booking one of two private downstairs rooms that will sleep two and four people respectively or of booking a bunk in an upstairs bunkroom. Right now, the tentative plan is to have a common room area on the second floor of the building, along with a small caretaker room. 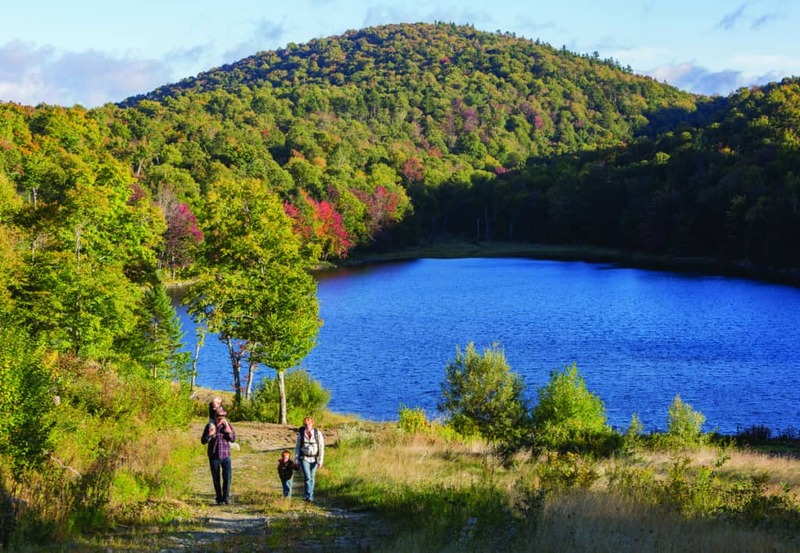 Thompson said that having a caretaker at this site will allow the organization to serve hikers and skiers who may be walking in without reservations from the Long Trail, the Catamount Trail and someday, the Velomont Trail. They will likely assist with trail maintenance on the property as well. “The idea is to ensure that people are being good stewards of the surrounding area and property,” said Thompson. The Vermont Huts Association has already identified a builder and designer to rebuild the South Pond cabin: Colby and Tobiason builders of Woodstock. Co-owner Erik Tobiason and his wife Laurel Tobiason have built seven shelters to date for the Green Mountain Club, including the popular Stratton Pond Shelter. Tobiason says the structure will be post and beam to inspire a homey atmosphere and ensure its longevity. Just last week, on Sept. 28, the Vermont Huts Association installed a new shelter at Chittenden Brook Campground in Rochester. The new Chittenden Brook Hut will also be open to visitors year-round, starting this winter. By the time the pre-built shelter was in the ground, it was booked for every weekend from December 2018 through mid-April 2019.